Applicator gumming up when applying Meguiars Deep Crystal pure polish??? Thread: Applicator gumming up when applying Meguiars Deep Crystal pure polish??? When I last waxed I was having some issues with my pad/wipe off cloth gumming up when applying Meguiars Deep Crystal pure polish. I'm not sure if I was using too much product or what I was doing wrong. So I began with a full wash of the vehicle, then towel dried it. I skipped the clay bar step as it had not been a long time between waxes. I applied a little product to my foam applicator, spread it around and rubbed it in, making sure to focus on any visible minor scratches. It worked well in hiding clear coat scratches, which is why I bought it. Obviously it will not hide deeper scratches but then I didn't expect it to either. I then wiped off the excess and buffed dry with a microfiber towel. 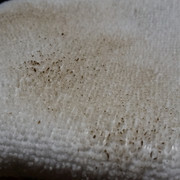 However I noticed that both my foam pad and wipe off towel started to gum up with with waxy brown substance. I'm assuming it was the polish. 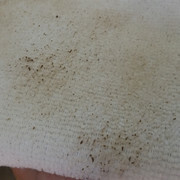 I tried to get a picture of it on my wipe off towel. Any idea why this might be occurring? What am I doing wrong? Re: Applicator gumming up when applying Meguiars Deep Crystal pure polish??? There might also be a situation that the liquid in conjunction with agitation from application could be "lifting" old wax from the surface. One way to mitigate this, is to switch out your applicator for a fresh one as needed. Same goes for the wipe off towel. How can I apply a pure polish (Deep crystal polish) with wax still on the car?